SANTA CLARA, Calif. (AP) — Alfred Morris knew the right opportunity would come, even as training camps opened and he remained home in Texas. Once the San Francisco 49ers called, Morris didn’t take long to get comfortable with his new team. With a stellar performance in Saturday’s exhibition at Indianapolis, the veteran running back appears to have earned a spot on the 49ers’ 53-man roster. Coach Kyle Shanahan said Morris may not even suit up for Thursday’s exhibition finale against the Los Angeles Chargers, a strong indication that the staff already views Morris as a regular-season contributor. Patience paid off for the two-time Pro Bowler. 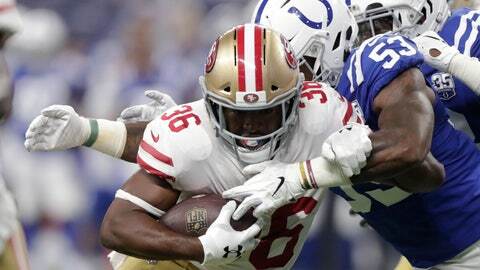 The 29-year-old Morris carried 17 times for 84 yards in Saturday’s 23-17 loss to the Colts, displaying a physical style of running that should fit well with San Francisco’s offense. Starting running back Jerick McKinnon is known more for speed and shiftiness, and the 5-foot-10, 222-pound Morris can provide a bruising change of pace. McKinnon and second-string running back Matt Breida have missed the majority of the preseason with injuries, which provided the opening for the 49ers to sign Morris on Aug. 13. McKinnon (strained calf) and Breida (separated shoulder) are expected to be available for the Sept. 9 opener at Minnesota. Shanahan, who’s familiar with Morris when both were with the Washington Redskins, liked what he saw Saturday. Shanahan confirmed that backup quarterback C.J. Beathard would start Thursday against the Chargers. Jimmy Garoppolo and several other starters are expected to be held out to avoid injury. When training camp began, Morris was at home in Cross Roads, Texas, a town of less than 1,500 people. He relished the extra time with his wife, Lindsey, their 3-year-old son, Josiah, and their 1-year-old daughter, Grace. At times, Morris said, he had to calm his wife’s nerves about when he might get a call from an NFL team. NOTES: Linebacker Reuben Foster (concussion) and running back Joe Williams (ribs) didn’t practice Wednesday, although Shanahan wouldn’t rule either out for Thursday. Foster would have to clear concussion protocol. . Tight end George Kittle (shoulder) returned to practice in a limited capacity. . The 49ers signed undrafted running back Ja’Quan Gardner to a three-year deal Tuesday and waived safety Chanceller James.